Myths of the Free Market is arguably the most significant book in economics and politics since John Maynard Keynes. It systematically presents a broad range of telling criticisms of free market economics, criticisms that have not been presented elsewhere. 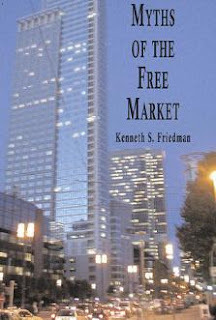 Despite our genuine faith in the free market, laissez faire has not maximized wealth.Myths of the Free Market systematically presents a broad range of telling criticisms of free market economics, criticisms that have not been presented elsewhere.While this book focuses on the U.S., we have become subjects of worldwide emulation. The implications of this book do not stop at our borders, but extend to a large and growing portion of the world.